Reading Sartre’s cookbook makes it clear why the man spent so much time in cafes. The six graduating members of the philosophy department presented their thesis research at the second annual Celebration of Creative Inquiry, held in the college dining rooms on Friday, May 1. 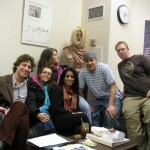 Representing the department were Kate Goodpaster, Joe Hillman, Laurel Hoch, Rhea Muchalla, Jeff Nichols, Caleb Phillips.